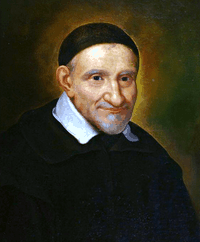 Background: St Vincent de Paul was ordained a Priest at nineteen. He was once held as a slave for two years. He devoted his life to serving the poor. He founded help groups and collected funds for missionary projects, hospitals, victims of war and paying ransoms to release gallery-slaves in Paris. He was renowned for his compassion, humility and generosity. He is Patron Saint of charities including, the St Vincent de Paul Society. His Feast Day is 27th September. the mention of your name suggests a litany of your virtues: humility, zeal, mercy and self-sacrifice. It also recalls your many foundations: Works of Mercy, Congregations and Societies. The Church gratefully remembers your promotion of the Priesthood. Inspire all Priests and Charity Workers, especially all who minister to the spiritually and materially poor. Almighty God, grant me the same grace that You bestowed upon your servant St. Vincent, to relinquish the temptation of material things in my holy effort to help the poor. I ask this through Jesus Christ our Lord. Amen.